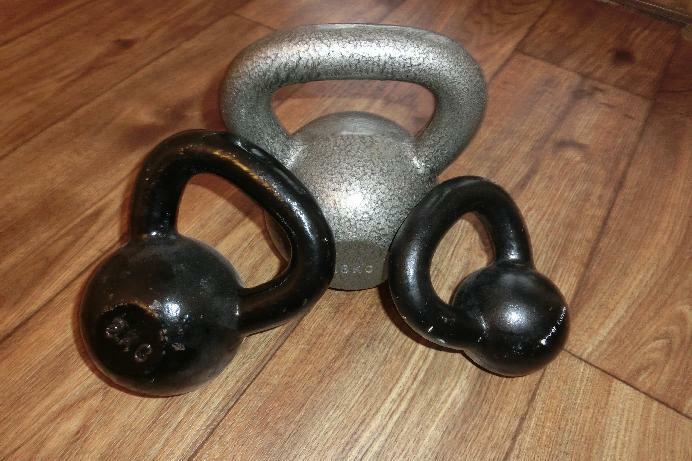 I wrote about the benefits of kettlebell workouts a long time ago (see here). I also wrote 4 articles in which I explained every single workout of my circuit in detail but I haven't wrote a summerizing article yet. As I want to give you one article with a brief overview of the very efficent circuit that I use, I decided to write this one now (it's also easier to have one article to refer to in future posts about workout plans). If you already know how to handle the "cannon balls", try to do three sets with the mentioned reps without a rest between the eight exercises (30 sec - 1 min rest between the sets). If you aren't familiar with kettlebells yet, you should start easily. And with easily I mean with a lower weight and a strict focus on the correct movement sequence. Once you are able to perform the exercises with a perfect technique you can increase the weight and then you should start with one set first and increase the volume up to three sets over time. For detailed explanations of the single exercises please click on the exercise name (the link will open a new tab with the explaining article). If you aren't sure if you should use kettlebells or what they can do for you and your fitness, read my article about the benefits of kettlebell workouts.